You have not viewed any vehicles. You do not have any saved vehicles. You do not have any unread Messages. Keep track of vehicles you are interested in, and get back to them from your phone, tablet, computer, or anywhere you’re shopping. Be the first to know when prices drop! Sign up to receive an email and always know when your saved vehicles change price. Should you trade in your existing vehicle? 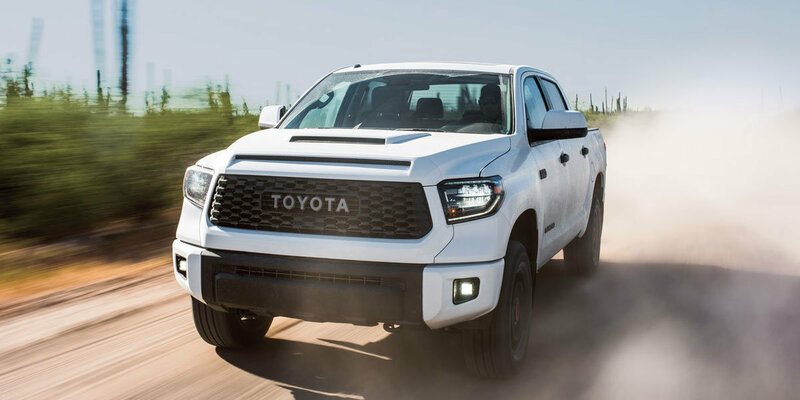 The 2019 Toyota Tundra is just the beast for which you have been looking. A robust 5.7-liter V8 engine producing 381 hp and 401 lb-ft of torque gives you more than enough grunt for any job. Want to haul cargo or tow a boat to Edgewater Marina without a fuss? 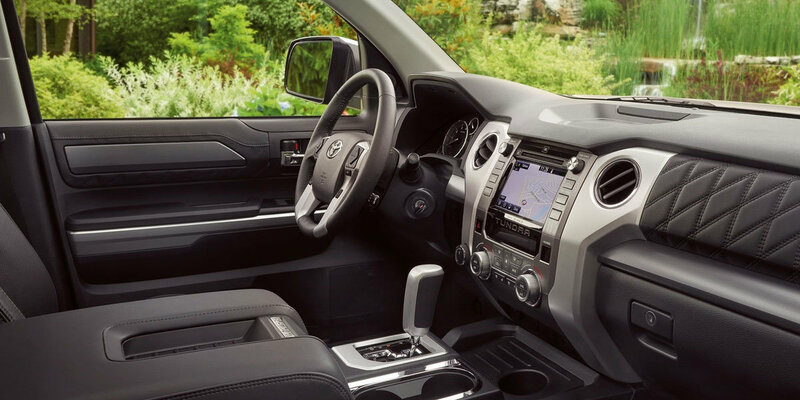 You should have the 2019 Toyota Tundra at the top of your list. 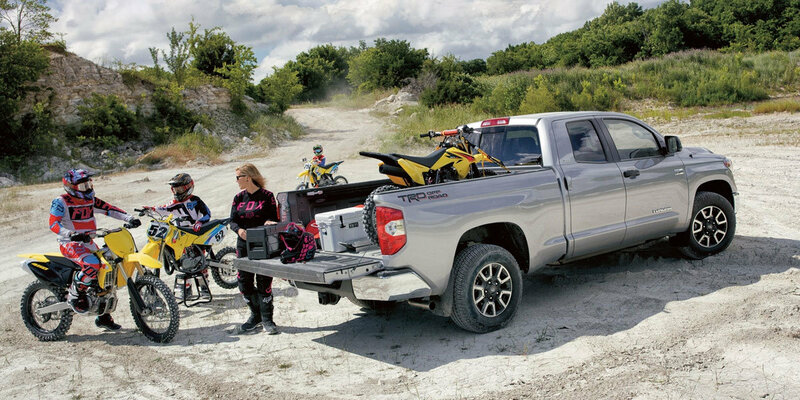 The 2019 Toyota Tundra is available in five trim levels, from the standard SR to the fully loaded Platinum Edition. Are you a regular at the annual Coopers Rock WinterFest? Show up in the TRD Pro edition with 20-inch TRD branded wheels, black trimmed LED headlights, high-performance Bilstein® shocks and dual black-chrome-tipped stainless steel exhaust. It is guaranteed to turn some heads. What a beautiful beast! Treating someone special to a show at Lyell B Clay Concert Theatre? Even the Jersey Boys and Chicago soundtracks will resonate true through the premium 12-speaker JBL® sound system. Powered by the Entune™ App Suite and controlled with a 7-inch high-resolution touch-screen, use integrated Bluetooth® to stream music or call and chat with friends safely while driving. Automatic high beams, Pre-Collision with pedestrian Detection and Lane Departure alerts are just a few of the features bundled into the 5-Star rated, Toyota Safety Sense System. 8 airbags surround the interior of this heavy hauler protecting you and your passengers at all times. Your 2019 Toyota Tundra is waiting at University Toyota! Schedule a test drive today and take the Tundra out for a spin. Call University Toyota at 304-244-3519, your full-service Morgantown Dealership of choice. Stand out when you go out. Choose a color to match your style. Instrument cluster screen size: 3.5 in. Instrument cluster screen size: 3.5 in. Instrument cluster screen size: 3.5 in. Instrument cluster screen size: 3.5 in. Instrument cluster screen size: 3.5 in. Infotainment screen size: 7 in. Infotainment screen size: 7 in. Infotainment screen size: 7 in. Infotainment screen size: 7 in. Infotainment screen size: 7 in. Includes 18-inch split 5-spoke trd off-road package alloy wheels with black accents and all-terrain p275/65r18 tires, trail-tuned bilstein shock absorbers, engine skid plate, fuel tank skid plate, front tow hooks, bedside trd off-road decal, and trd off-road floor mats. Includes front and rear carpet floor mats, door sill protectors, first aid kit, and spare tire lock. Includes navigation system, 7-in. High-resolution touch-screen with split-screen display, am/fm cache radio, hd radio, cd player, 9 speakers, auxiliary port, usb 2.0 port with ipod connectivity and control, advanced voice recognition, hands-free phone capability, and phone book access and music streaming via Bluetooth® wireless technology, siri eyes free, entune app suite, hd radio predictive traffic and doppler weather overlay, and siriusxm satellite radio with 3-month all access trial. Includes front bucket seats, power driver's seat with power lumbar support, front center console with floor-mounted urethane shift lever and knob, tilt and telescopic urethane steering wheel, three front cup holders, and anti-theft system with alarm and engine immobilizer. Includes bed extender, exhaust tip, brushed stainless steel stepboards, and spare tire lock. Includes front and rear parking assist sonar, blind spot monitor, rear cross-traffic alert, and color-keyed rear bumper. Includes front and rear parking assist sonar, blind spot monitor, and rear cross-traffic alert. Includes front and rear parking assist sonar, blind spot monitor, rear cross-traffic alert, anti-theft system with alarm, glass breakage sensor and engine immobilizer, power windows with driver and front passenger auto up/down, cab, driver footwell and ignition-key illuminated entry system, and color-keyed rear bumper. Includes 18-inch 5-spoke black alloy wheels and color-keyed front bumper endcaps, grille surround and rear bumper. Removes all exterior badging. Includes 20-inch 6-spoke trd sport package alloy wheels with black accents and luxury sport p275/55r20 tires, sport-tuned bilstein shock absorbers, trd front and rear anti-sway bars, color-keyed grille surround, mirror caps and front and rear bumpers, led headlights, led fog lights, trd sport floor mats, trd shift knob, hood scoop, and bedside trd sport decal. 1. MSRP excludes the Delivery, Processing, and Handling Fee of $920 for Cars (Yaris, Yaris iA, 86, Corolla, Corolla HB, Camry, Camry HV, Prius LB, Prius c, Prius Prime, Mirai, Avalon, Avalon HV), $1045 for Small/Medium Trucks, SUVs and Van (C-HR, RAV4, RAV4 HV, Highlander, Highlander HV, 4Runner, Sienna, Tacoma), $1,295 for Large SUVs (Sequoia, Land Cruiser), and $1,395 for Large Truck (Tundra). (Historically, vehicle manufacturers and distributors have charged a separate fee for processing, handling and delivering vehicles to dealerships. Toyota's charge for these services is called the "Delivery, Processing and Handling Fee" and is based on the value of the processing, handling and delivery services Toyota provides as well as Toyota's overall pricing structure. Toyota may make a profit on the Delivery, Processing and Handling Fee.) Excludes taxes, license, title and available or regionally required equipment. The Delivery, Processing and Handling Fee in AL, AR, FL, GA, LA, MS, NC, OK, SC and TX will be higher. The published prices do not apply to Puerto Rico and the U.S. Virgin Islands. Actual dealer price will vary. 2. 2017 EPA-estimated city/highway mileage. Actual mileage will vary. 3. 2018 EPA-estimated mileage. Actual mileage will vary. 4. 2019 EPA-estimated 29 city/41 highway/34 combined mpg for Camry L. Actual mileage will vary. 5. 2018 EPA-estimated 29 city/41 highway/34 combined mpg for Camry L. Actual mileage will vary. 6. 2017 EPA-estimated mileage. Actual mileage will vary. 7. 2017 EPA-estimated 19 city/27 highway/22 combined mpg for Sienna FWD. Actual mileage will vary. 8. 2017 EPA-estimated 54 city/50 highway/52 combined mpg for Prius. Actual mileage will vary. 9. 2017 Prius Prime EPA-estimated combined mpg. Actual mpg will vary based on driving habits, weather, temperature and road/traffic conditions. For more information on mpg, please see www.fueleconomy.gov. 10. 2018 Prius Prime EPA-estimated combined mpg. Actual mpg will vary based on driving habits, weather, temperature and road/traffic conditions. For more information on mpg, please see www.fueleconomy.gov. 11. 2017 Prius Prime EPA-estimated combined MPGe. Actual MPGe will vary depending upon driving conditions, how you drive and maintain your vehicle, and other factors. Battery capacity will decrease with time and use. For more information, see www.fueleconomy.gov. 12. 2018 Prius Prime EPA-estimated combined MPGe. Actual MPGe will vary depending upon driving conditions, how you drive and maintain your vehicle, and other factors. Battery capacity will decrease with time and use. For more information, see www.fueleconomy.gov. 13. 2017 EPA-estimated 67 city/67 highway/67 combined MPGe for Mirai and 312-mile driving range. Actual mileage will vary. Range measurement pursuant to SAE J2601 standards (ambient temperature: 20°C; hydrogen tank pressure when fueled: 70 MPa). Fueling time varies with hydrogen fueling pressure and ambient temperature. 14. 2018 EPA-estimated 67 city/67 highway/67 combined MPGe for Mirai and 312-mile driving range. Actual mileage will vary. Range measurement pursuant to SAE J2601 standards (ambient temperature: 20°C; hydrogen tank pressure when fueled: 70 MPa). Fueling time varies with hydrogen fueling pressure and ambient temperature. 15. 2018 C-HR preliminary 27 city/31 highway/29 combined mpg estimates determined by Toyota. EPA ratings not available at time of posting. Actual mileage will vary. 16. 2018 EPA-estimated 19 city/27 highway/22 combined mpg for Sienna FWD. Actual mileage will vary. 17. 2018 EPA-estimated 54 city/50 highway/52 combined mpg for Prius. Actual mileage will vary. 18. 2019 Toyota Avalon XLE preliminary 22 city/32 hwy/26 combined mpg estimates determined by Toyota. EPA estimates not available at time of posting. Actual mileage will vary. 19. 2019 preliminary mpg estimates determined by Toyota. EPA estimates not available at time of posting. Actual mileage will vary. 20. 2019 EPA-estimated mileage. Actual mileage will vary. 21. 2019 Corolla Hatchback XSE with automatic transmission preliminary 30 city/38 hwy/33 combined mpg estimates determined by Toyota. EPA ratings not available at time of posting. Actual mileage will vary. 22. 2019 Sienna preliminary 19 city/27 hwy/22 combined mpg estimates determined by Toyota. EPA ratings not available at time of printing. Actual mileage will vary. 23. 2019 EPA-estimated 32 city/40 highway/35 combined mpg for Yaris with automatic transmission. Actual mileage will vary. © 2017 UNIVERSITY TOYOTA. ALL RIGHTS RESERVED.